'그레이트 코리안 비어 페스티벌'은 미디어파란에서 2013년부터 기획/주최하고 있는 국내 최초, 최대 수제 맥주 축제입니다. 수제맥주와 푸드페어링/ 라이브 공연/ 코스튬 콘테스트 등이 어우러져 내국인과 외국인 모두 함께 즐길 수 있는 글로벌 행사의 장 입니다. 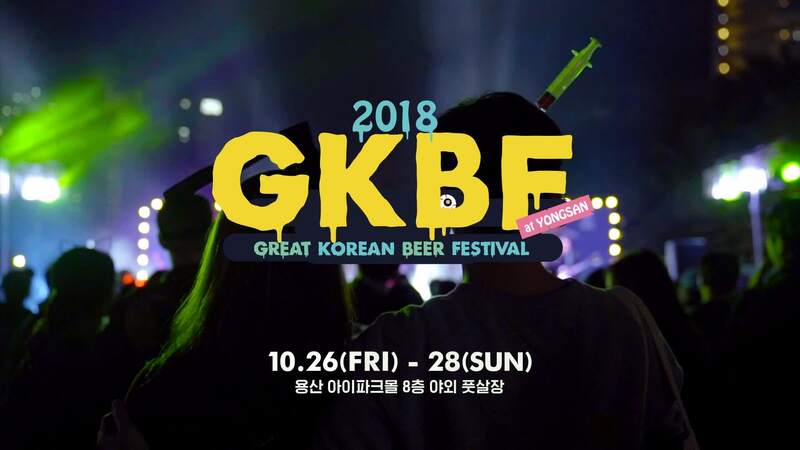 The Great Korean Beer Festival (GKBF) is the first and largest craft beer festival in Korea, first held in 2013. The 11th GKBF will take place for 3 days from Oct. 26th (Fri) - Oct. 28th (Sun). Festival-goers will get to enjoy various global foods, domestic and imported craft beers, live performances, and daily Halloween costume contests all in one place on the rooftop of Yongsan I’PARK Mall against the backdrop of the beautiful night sky. * 참가업체 및 맥주/음식 출품 리스트는 상황에 따라 달라질 수 있습니다. * 본 행사는 만 19세 이상의 성인만 참여 할 수 있는 행사로 입장시 반드시 신분증을 지참하셔야 합니다. * 영유아 또는 어린이의 경우, 부모님 또는 성인 보호자 동반시 입장 가능합니다. * 행사 진행 중, GKBF 촬영 스텝에 의해 촬영되는 사진 및 동영상은 GKBF 주최측에 귀속됩니다. * Participating businesses and menu items are subject to change. * Valid photo ID required for entry. * Children may be admitted with an accompanying parent or guardian. * GKBF owns all rights to any photos/videos taken by GKBF staff during the festival. 네이버 검색창에 "GKBF@"으로 검색하도록 안내하세요.